This year, unlike years in the past, I didn't do my version of a traditional Rosh Hashanah meal. This is mostly because I don't actually know anything about how to cook Rosh Hashanah foods and after getting angry letters about how insulting my attempts were to Jews around the world I opted to lay off this year. 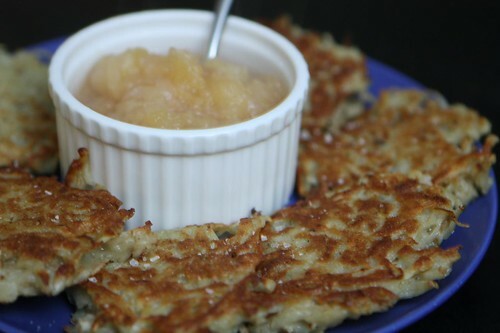 But that doesn't mean I didn't still make some latkes! Latkes are, of course, a traditional German food and I decided that these were traditional German latkes and not traditional Rosh Hashanah latkes regardless of the fact that I just made them the same way I always make them. I grated some potato into a bowl and tossed with salt, pepper, a dash of cider vinegar, an egg, and some flour then I fried them in a pan. Normally I'd grate onion as well but I was surprised to find that we had no onion. The learning experience from this event was that the onion doesn't actually make that much difference. Go figure! I also made a giant pot of applesauce since we got a metric ton of apples from the farm this week. This was convenient because applesauce was also a traditional pairing for our main course. I haven't made Sauerbraten since I was in culinary school so I figured I was about due to make it again. This was the perfect item to make for this strange Rosh Hashanah/Oktoberfest hybrid holiday. Brisket, in the German style, with potato latkes, and German beer. It's like fusion cuisine, weak fusion cuisine. One thing I like to do when cooking European cuisine is to consult Culinaria European Specialties, the two volume set of cookbooks I got in 1995. The set contains fantastic traditional recipes from all the countries of Europe. The effect of this is lost slightly when I come in and bastardize it with my missing ingredients and laziness. I took a piece of brisket on Monday and marinated it in red wine, water, cider vinegar, salt, peppercorns, juniper berries, cloves, mustard seed, onion, carrot, bay leaves, and dried rosemary. Today I removed it from the marinade, seared it in butter, olive oil, and canola oil, then added some more onion, the marinade, and simmered it for 2-3 hours. When it was fork tender I drained all the liquid through a strainer and added some soaked raisins. You're supposed to add gingerbread to this sauce. Since we don't have any I used some of Jen's pumpkin bread as an alternative. You're also supposed to add red wine and red currant jelly. I figured there was enough red wine involved already. When the sauce had simmered for about ten minutes before finishing with some jam, salt, and pepper. Since we have a cupboard full of jellies and jams I decided to use this cerise noir au thym from Corsican company Corsica Gastronomia. 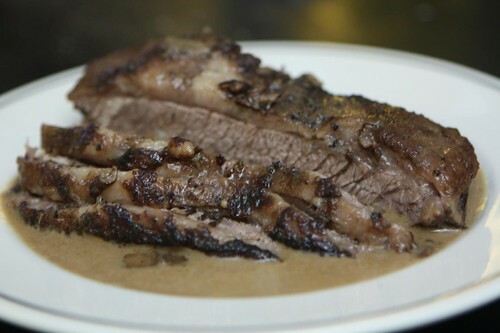 I cooked the sauce down, pureed it, and sliced the brisket on top of the sauce. 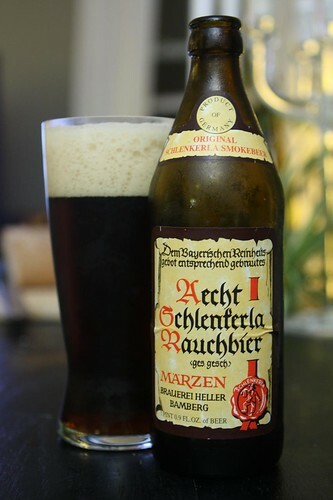 To accompany this meal/amalgamation I had this Aecht Schlenkerla Rauchbier from Schlenkerla in Bamberg. I'd been wanting to try this ever since I saw the episode of The Beer Hunter with Michael Jackson entitled "The Fifth Element." In it he shows how they make this beer by burning beechwood with the malt. Michael Jackson says that the locals claim you need to have six or seven liters of the beer before you acquire a taste for it. I can see why, it's very strange. It kind of reminds me of yerba mate only a little less disgusting. Michael Jackson claims he loved it the first time he had it. I think he did this just to show off how much of a beer expert he is. Michael Jackson recommends having this beer with smoked Bavarian ham. Since we didn't have any smoked Bavarian ham I decided to substitute the next best thing: 1986 Eddie Murphy vehicle The Golden Child. This was an adequate substitution. When you can't have a nice smoked ham sometimes you have to watch Eddie Murphy yell at a bunch of Tibetans instead.